Math just met "warp drive" in a virtual reality headset to transport anyone who dons the visor to a reality twisted by hyperbolic geometry. The program was co-created by Sabetta Matsumoto, a physicist and applied mathematician at the Georgia Institute of Technology as a visual aid to researchers exploring geometries that deviate from the everyday norm. Splashed in color, the virtual space's graphics can seduce even the most math-phobic mind to roam, crawl or slither about. When Matsumoto or her collaborator, mathematician Henry Segerman from Oklahoma State University, do that, they're actually exploring particular geometric nooks. "If you walk around in this space, things that started out horizontal and vertical become twisted and weird," Segerman said, as he donned a VR headset. He slid around a diamond-like shape in VR hyperbolic space, describing it. "It never stops, just keeps going, and you never get to the back side of it." Most people have never consciously seen hyperbolic geometry, as opposed to Euclidean geometry, which is how we usually experience the world. We'll go into the difference between them in the next section. In the meantime, if you'd like a peek at the warped rainbow weirdness yourself, go here: h3.hypernom.com. You can navigate it with your VR headset or smart phone via a webVR interface. Or you can peruse it on a computer in 2D using the arrow keys. But be a little careful walking around the 3D version, as the hyperbolic space doesn't have a floor to provide visual balance orientation, and turning corners is very different from in everyday life. That weirdness can give the non-mathematician an idea of how picturing non-Euclidean geometries mentally can strain even the minds of mathematicians and physicists. Segerman and Matsumoto collaborated on the hyperbolic virtual reality experience with a collective of mathematician-artists called eleVR to make the work of the geometry experts easier and more productive. "Visualizations can help to prove theorems that are purely abstract, and physicists want to get an intuition for what's going on," said Matsumoto, an assistant professor in Georgia Tech's School of Physics. "The virtual reality takes something that would normally live in a set of equations, and makes something you can interact with." Sci-fi fans may remember hyperspace, created when "warp drive" engines curve spacetime so that the Starship Enterprise can travel at multiples of the speed of light. Meanwhile, inside the ship, everything is shaped and moves "normally." That's fiction, but it makes for a nice bridge to hyperbolic geometry and how this new VR program takes viewers hyperbolic from the much more customary Euclidean geometry experience of everyday life. Some 2,300 years ago, mathematician Euclid of Alexandria developed the geometry commonly taught today in high school. The basics are: Points, straight lines, angles, and planes that are flat and extend infinitely. There are triangles, rectangles, circles, spheres, cubes, etc. We recognize this geometry when we look at buildings, desks or coffee cups. If you warp a Euclidean plane like a Pringle's potato chip, giving it hyperbolic curves, you get an idea of hyperbolic geometry. Since we usually live in a Euclidean reality, the warped plane would now look to us like a three-dimensional object, but it's still a plane, so it's really two-dimensional. That warp changes principles: Parallel lines curve away from each other; triangles have warped lines, and there's no such thing as a rectangle as we know it. And when you've warped the plane, it warps all of space at the same time. Matsumoto and Segerman's new virtual reality program detects head motions in 3D Euclidean space and warps them into virtual movement in 3D hyperbolic space. And it gives the VR wearer a visual output that is Euclidean, i.e. "normal." Hyperbolic geometry isn't just hypothetical. It describes some actual physics, and is yet another example that there's more to reality than meets the eye. For example, gravity from massive celestial bodies bends rays of light. Accordingly, hyperbolic geometry was helpful in arriving at the Theory of Relativity, which describes realities of spacetime outside the habits of human perception, though not completely out of perceptual reach. If you consciously encountered hyperbolic geometry, you'd be capable of experiencing it. "If we were in it, we could see it, feel it or walk through it," Matsumoto said. Humans already commonly experience a geometry called spherical geometry thanks to air travel. When we stand on the ground, we experience its surface overall as level, like our ancestors, who for ages believed that the Earth was flat. When you look out the window of the airplane, it may feel you're moving over a Euclidean plane, when you're really over a spherical plane. That has geometric consequences. "If you start at the North Pole and take any path south, then turn left 90 degrees and go a quarter of the way around the world, and you turn left again 90 degrees and go the same distance, then you'll arrive back at your starting point. This wouldn't happen on a Euclidean plane with the same two turns," Matsumoto said. Mathematicians can break up the three dimensions we perceive into eight different geometries, which could help unlock more physical realities even more mind-bending than Relativity or as simple as the Earth being round. "We don't know what topology the universe has," Matsumoto said, "whether it's an expanding sphere, if it's hyperbolic, if it's got holes in it." A few decades after the math of hyperbolic geometry was firmed up in the late 1800s, pioneering artist M. C. Escher illustrated how warped geometry can reveal twisted reality. His drawings are famous for contradictory perspectives seamlessly married in a single motif, like odd stairways or aqueducts. His circles with animals that interlace perfectly were a take on a Poincaré disk, a depiction of a hyperbolic plane (2D), in which repeating shapes, all the same size, appear large in the middle and increasingly smaller toward the circle's edges to represent the hyperbolic warp stretching to infinity. Such shapes are called "tiling." Repetitive tiling of an area to convey its characteristics is called "tessellation," which has become a common tool in geometric illustration. Animated 3D tessellation conveys hyperbolic space in Matsumoto and Segerman's virtual reality. 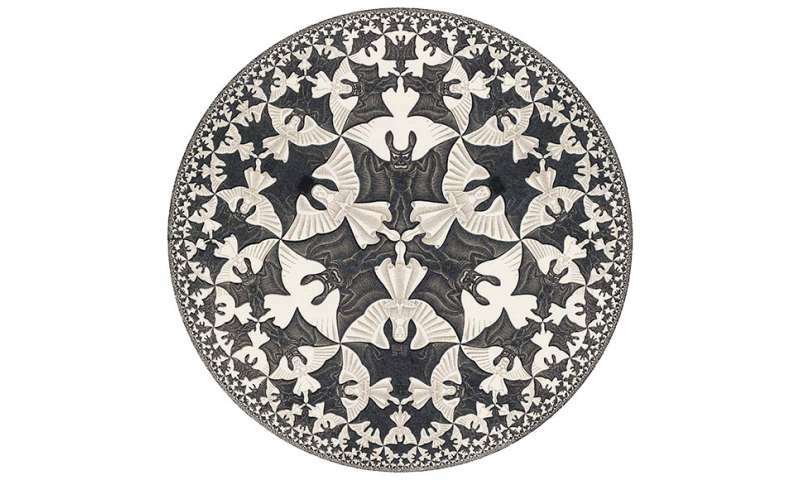 Other notable mathematical artists employing animated or 3D tessellation today are Jos Leys, who uses attractive computer graphics, and Jeff Weeks, who developed a three-dimensional hyperbolic space visualization software, which was an inspiration to Matsumoto and Segerman. Matsumoto's own passion for art inherent in geometry goes back to childhood, when she first developed tangible instincts like those she wants to convey with the VR program. "I've always loved math, and my mom always knitted and sewed. So, from a very early age, I knew how to piece together parts of a dress. It turns out these things are really, actually complex geometry." In the future, Matsumoto, like Alice in Wonderland, a metaphor Matsumoto employs herself, wants to make the leap into a weird "actual reality" experience of hyperbolic geometry. "The end game of this is going to be to make a museum installation where people can walk through, like a house where everything is hyperbolic, and you can do things like play basketball or play pool." The research team has also created a virtual reality experience combining hyperbolic and Euclidean geometry (H2 X E), which can be found at: h2xe.hypernom.com. Any opinions, findings, and conclusions or recommendations expressed in this material are those of the authors and do not necessarily reflect the views of any sponsoring agencies.